The sports-venue industry continues to be a key focus for Ross Video (Booth SL3305), and, at Sunday night’s NAB Keynote at the Tuscany Suites and Casino, the company unveiled the latest addition to its sports-venue production portfolio. Carbonite Mosaic, the company’s first multiscreen image processor, is designed to work in tandem with its XPression Tessera to drive the massive displays found throughout North American sports venues. Two years ago, Ross Video unveiled XPression Tessera during its annual NAB Keynote, and today, that system powers the most eye-catching displays in sports. However, within the venue, the video processor tied to Tessera had always come from a vendor other than Ross. With Carbonite Mosaic, venues can provide the high-resolution and layering capability needed to create large-screen imagery. It features a 20,736,000-pixel raster, 36 inputs, 18 scaling engines, HDR conversion, and more. During the Keynote, Moore announced that the NBA’s Atlanta Hawks had already become Mosaic’s first customer. 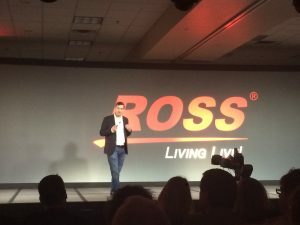 Ross Video’s David Ross addresses his company’s traditional NAB Keynote. Ross Video also used its NAB Keynote to demonstrate its commitment to IP production. CEO/President David Ross’s “One More Thing” has become an expected and highly anticipated staple of the Keynote, and he continued that tradition last night, closing out the Keynote with the introduction of Ultrix IP. Calling it a “much-needed Swiss Army knife for IP facilities,” Ultrix IP can handle 16 3G IP I/Os or eight UHD I/Os and is fully AIMS-compliant with the SMPTE ST 2022 and 2110 standards. In addition, Ross Video announced new hardware and software for XPression and unveiled Carbonite Black Solo 13, a self-contained production-switcher/hardware-panel combination with 13 inputs and six outputs. The company also announced a number of new features for its Carbonite Black switcher. Carbonite V13.0 features Live Assist DashBoard Menu improvements and makes Carbonite VirtualPanel available, enabling full control over Carbonite without a physical control panel. In addition, color correctors now include presets for color temperatures and SDR to HLG1200/HLG1200 to SDR (709 color space) presets are now included. The latest update to Acuity, the company’s flagship production switcher, includes a floating 3D DVE (MV Cards can now have a DVE installed and share system-wide), 2020 WCG HDR conversion on Input Processing Boards and on Output Boards, and additions to Custom Controls for user requests. Acuity supports various HDR formats in both HD and UHD, and both Carbonite Black and Acuity offer 12-gig single-coax 4K connectivity. Ross Video’s Ultrix FR5 makes its North American debut. The routing and A/V-processing platform is now available in a 5RU 144×144 form factor, replacing up to five racks of traditional infrastructure products. The theme of this year’s NAB Keynote — and the theme of the company’s recently revamped website — is Living Live!, and Ross Video took every opportunity to show off the live capabilities of its product portfolio. The company also had a little fun, following up its announcement of Frontier 2.0 (the hyper-realistic–graphics-rendering platform developed in collaboration with The Future Group AS, based on Epic Games’ Unreal 4 gaming engine, and used during Super Bowl LII) with the introduction of “Digital Dave,” a graphically rendered version of David Ross in an Ottawa Senators jersey dancing and doing backflips.